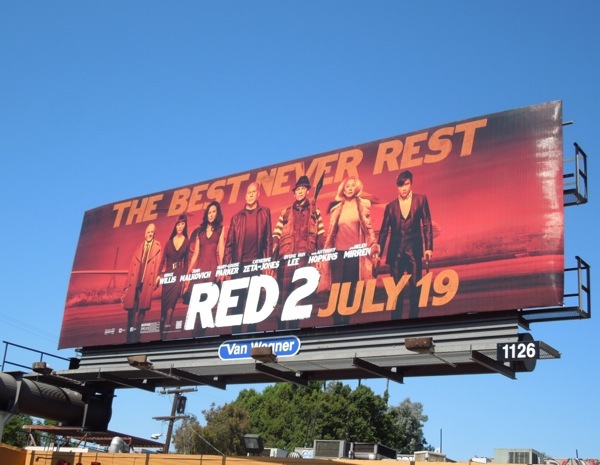 It's true what they say, 'The best never rest' and now the cast of Red 2 are joined by even more big Hollywood names in the form of Oscar winners Anthony Hopkins and Catherine Zeta-Jones, plus rising action star Byung-hun Lee (G.I. 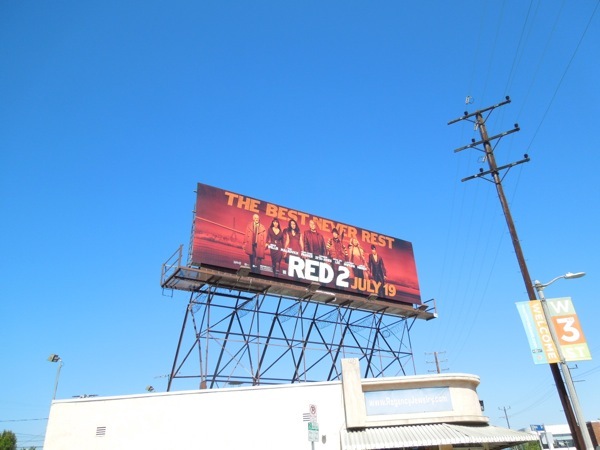 Joe's Storm Shadow). 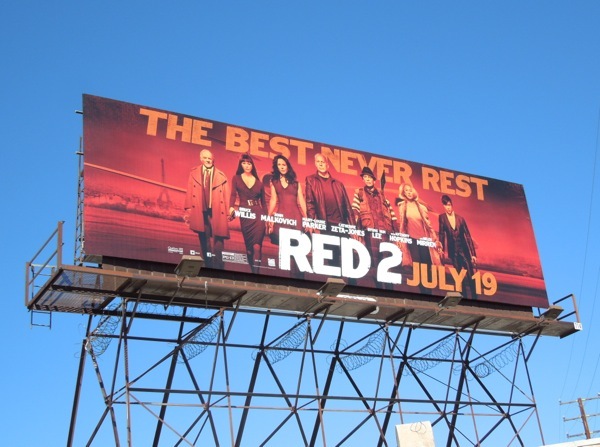 They join retired black-ops experts Bruce Willis and John Malkovich, plus (not so retired assassin) Helen Mirren, in a story involving Cold War nuclear weapons, assassination attempts and old flames, when all ex-CIA agent 'Frank Moses' (Willis) wants to do is lead a normal life with Mary Louise-Parker's 'Sarah Ross'. 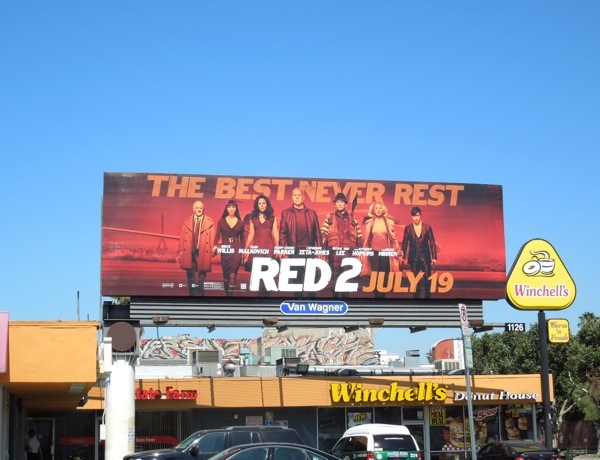 You can't miss this very red billboard creative for the action-comedy sequel and these ads were spied along Melrose Avenue and 3rd Street on June 26, 2013. 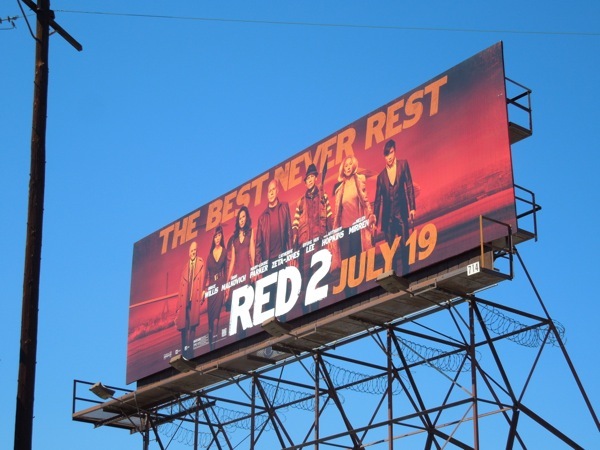 If you're a fan of the film franchise inspired by the DC Comics limited series by Warren Ellis and Cully Hamner, be sure to also check out the original Red movie billboard from September 2010.